Balance. A recurring theme in the new CD from the Rotating Leslies. "Equipoise" blends an exquisite balance of poetic lyrics, characteristic percussion, and exotic sounds. If you ask Rotating Leslies about their sound, they will describe it as 'tribal'. I agree, but I find this CD to bring to mind an exotic mid-eastern scenario. Take the lyrics to the song "Understand" for example.... "picture if you can a silhouetted room syncopation bathed in peach perfume... can you feel the waves of rhythm mesmerize within this velvet groove... you are consumed, can you feel the movement lift you off the ground, ignore the world to which your feet are bound". The melody of this track is repeated in track 7 "Only Life" with a clever play on lyrics. Where you are asked to "close your eyes and step inside" on track 2; you are asked to "take another look around" and "watch the world beneath your feet go spinning round" on track 7. While Jeff Dood (bass/vocals) admits to not setting out to do a "concept album", there are many underlying meanings with this CD. "Equipoise" means "a state of equilibrium or balance", and he admits this is the intentional theme to this album, which is carried out through the lyrics as well as the chosen order of the songs (awake to asleep), the songs themselves, and even the artwork on the inside CD cover. "Everything in life seems to have it's other side to balance it out", says Jeff. The Leslie's enlist the help of Karling Abbeygate for additional vocals, as well as the use of a french horn on the song "Let Me In". Karling Abbeygate's vocals fuse nicely with the vocals of Jeff Dood on "So Near". One of my favorite tracks is "Painting Pictures Blue", where the bass guitar seems to reach out and make you want to get up and dance; but this entire CD seems to have that effect. It seems to relax, yet simultaneously makes you want to move. I think that has a lot to do with the heavy percussion which is the center to most of the Leslie's music, as well as the funky bass. Balance. Equilibrium. Symmetry. 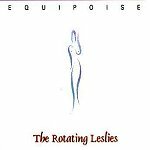 I think The Rotating Leslie's found a wonderful balance with the CD "Equipoise".